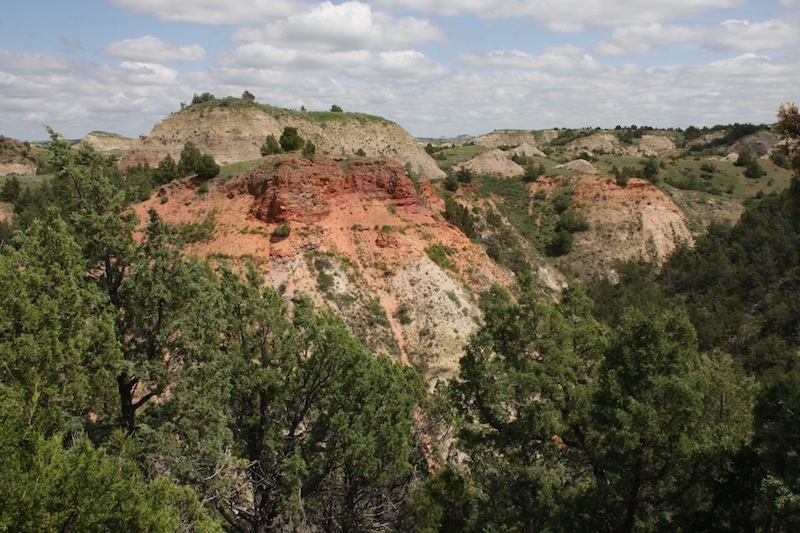 Today we drove from the Badlands in North Dakota to the Black Hills in South Dakota. 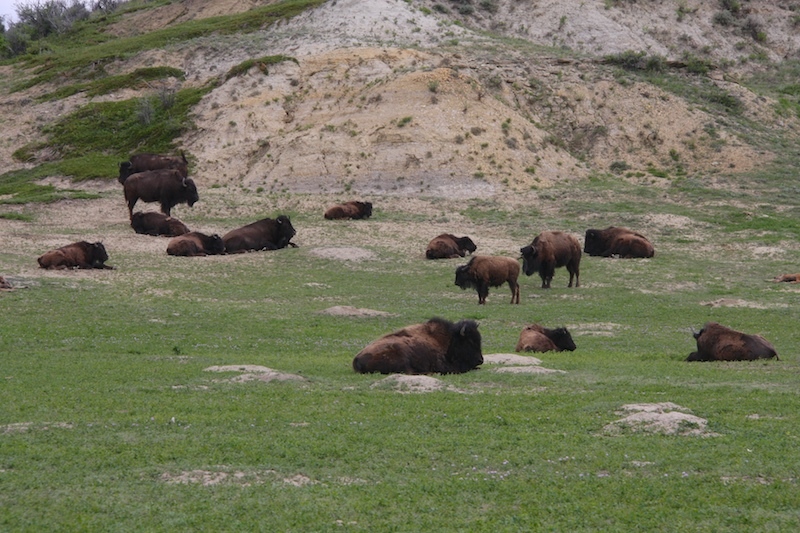 We started the day at Theodore Roosevelt National Park in Medora. 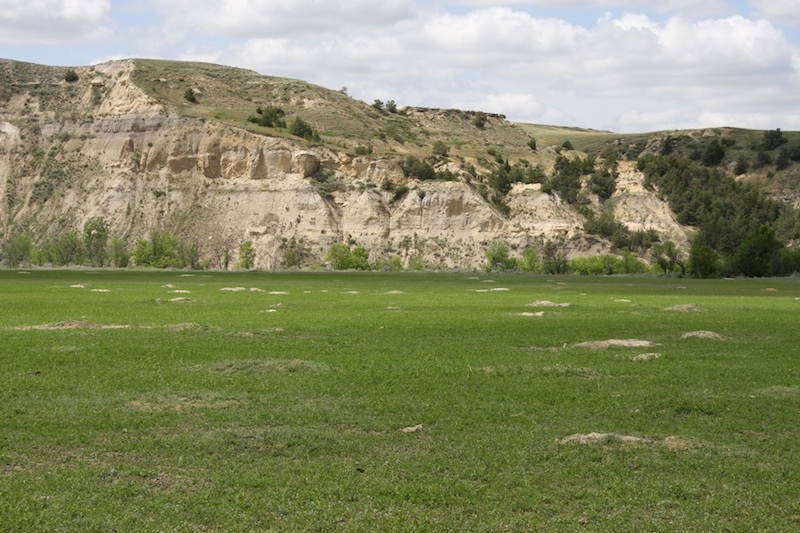 Theodore Roosevelt went to Medora in the 1883 to hunt and become a rancher. As he spent more time in the Dakota Territory, he became alarmed by the damage that was being done to the land and its wildlife. When he became president, he used his authority to protect wildlife and public lands by creating the U.S. Forest Service. During his presidency, he protected approximately 230 million acres of public land. 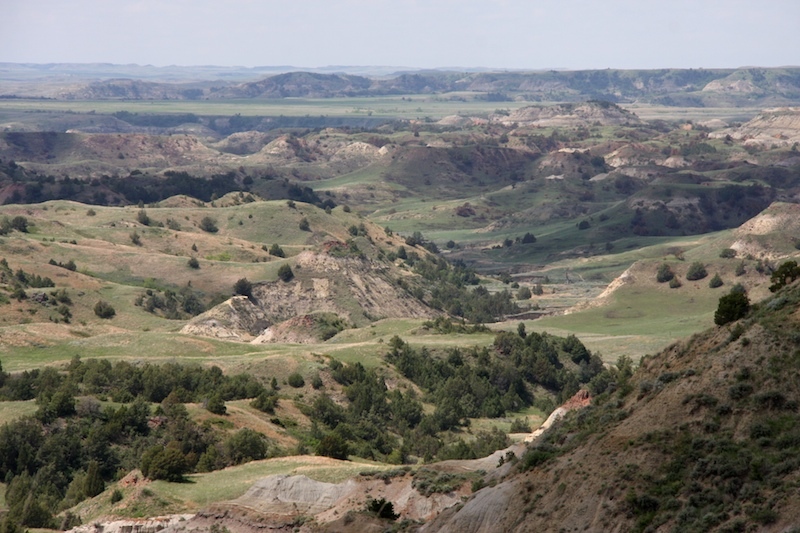 It was in the Dakota Badlands where he developed his national conservancy idealisms. The Badlands is a very rugged, yet beautiful landscape. We explored the area for about an hour. We got to see buffalo again, probably for the last time on this trip. 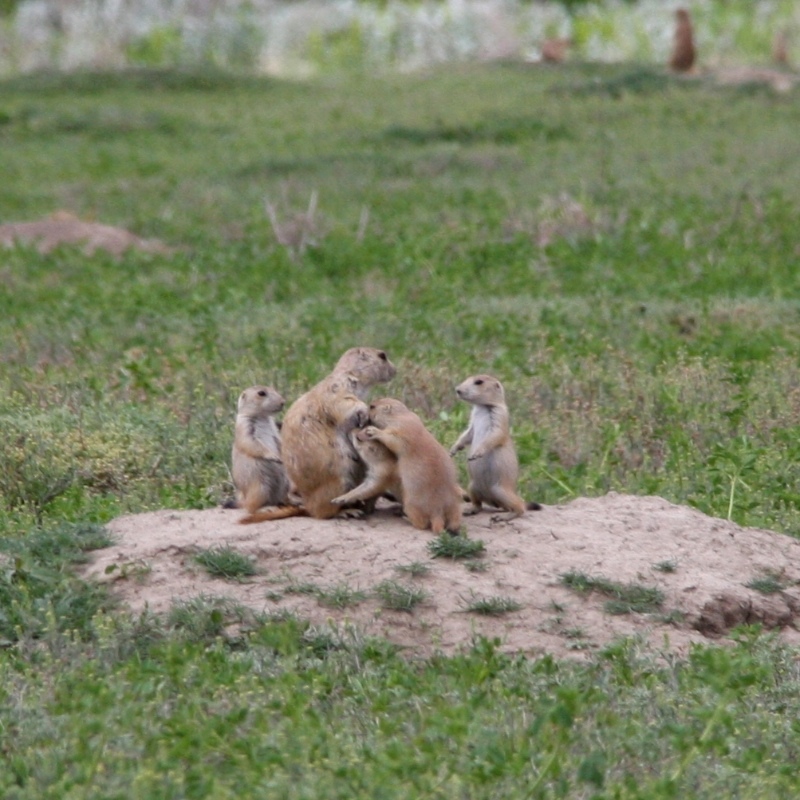 We also saw thousands of prairie dogs in these prairie dog towns. There were several of these towns in the park and thousands of prairie dogs live in each town. Here's a cute close up of a family of at least 5. 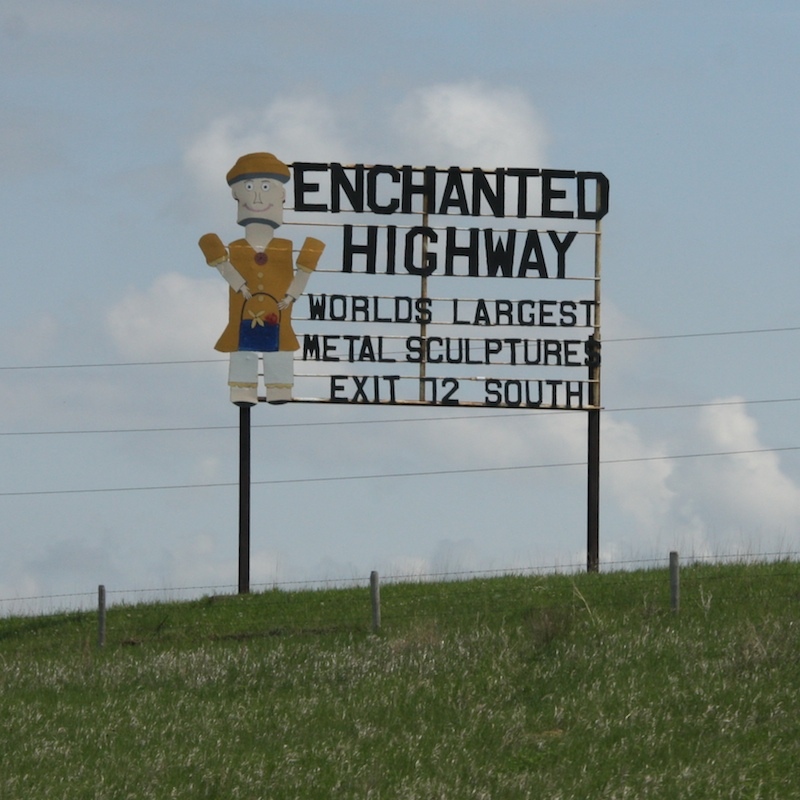 Then we headed east just a bit more to The Enchanted Highway. 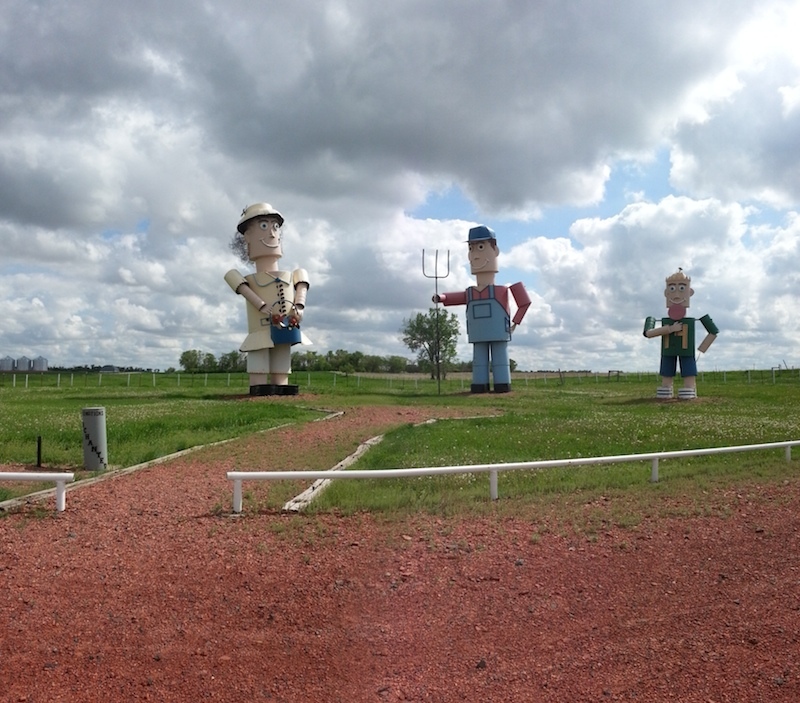 If you like roadside kitch, then this is the road to travel on. 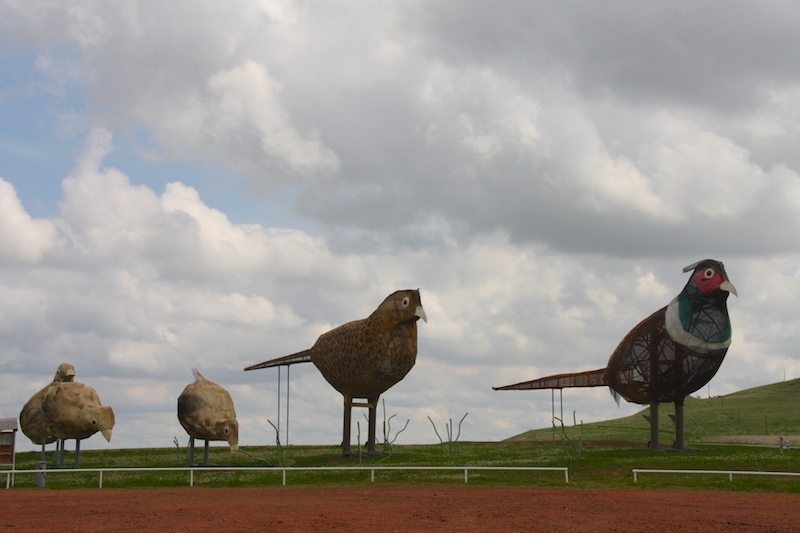 Along this highway there are several massive metal sculptures. You can see how big these things are. The artist started in 1990 and is still making them today. This one, titled "Fisherman's Dream" is his most elaborate one to date. This one is "Grasshoppers in the Field". But there were way more than grasshoppers in this field. Along with the other 5 grasshopper sculptures you can't see in this photo, there were thousands of biting bugs, including my favorite, the nasty mosquito. Getting out to pose for this photo was a mistake because not only did i get bit several times, they wanted to hitch a ride inside the car, too. But it definitely made that drive much more interesting. I am a fan of roadside kitch. 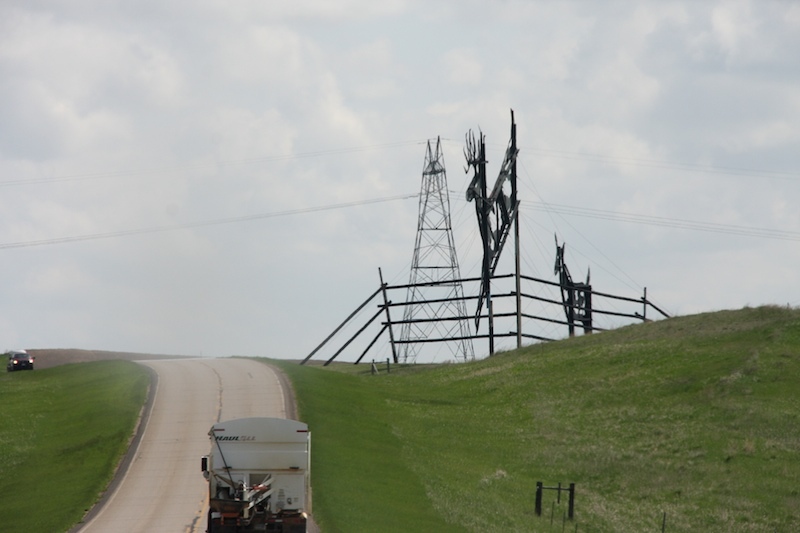 Driving to South Dakota, the northern plains landscape was enjoyable. 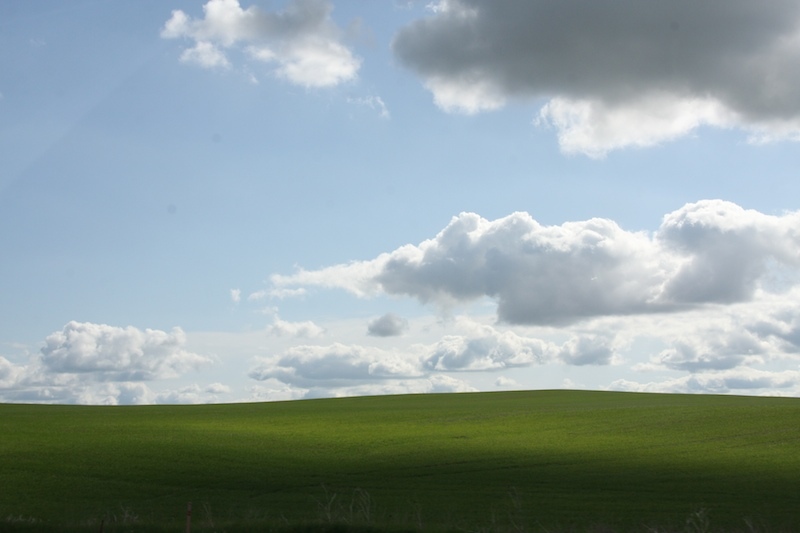 Lots of rolling hills and buttes and the greenest of pastures. But the conditions are harsh. Winters must be terrible living on the plains. 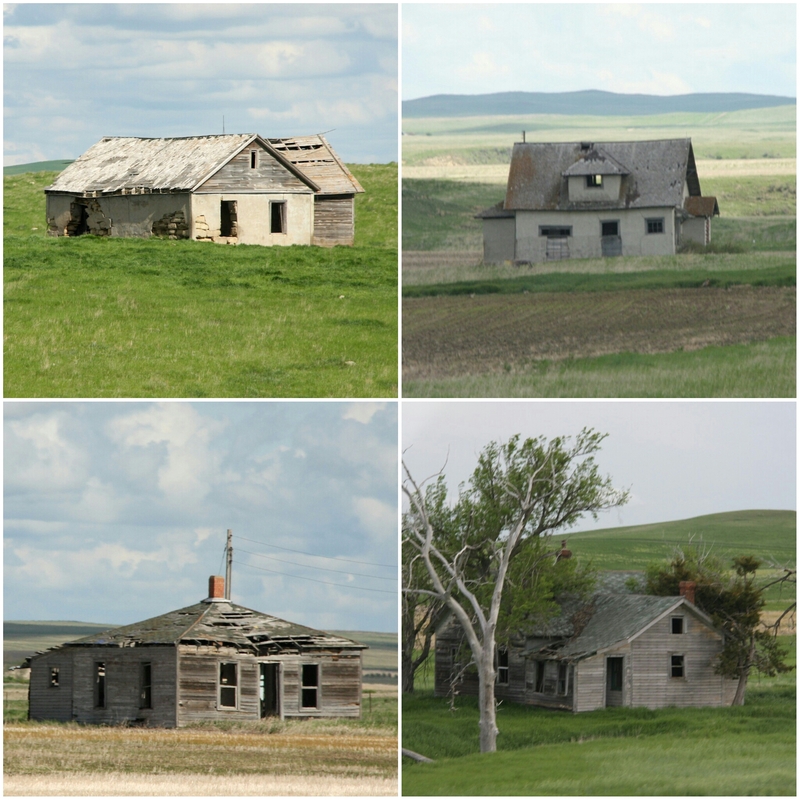 Homes were few and far between, mostly small ranches and farms that were miles away from each other. There were lots and lots of abandoned homes along this stretch of road that brought us to South Dakota. Some of them had newer homes built near or next to them. There is something romantic about living in the country, maybe because I watched so much Little House on the Prairie when I was a kid. But being the California girl that I am, it was very hard for me to imagine living in this remote area in such a harsh winter environment. Besides, all those bugs would eat me alive and I wouldn't last a day. 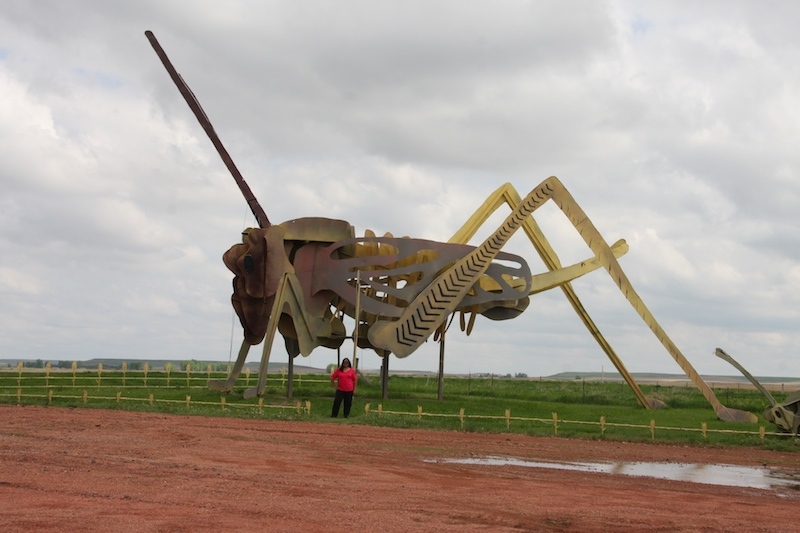 You did a great job seeing the sights in North Dakota, and you're right the mosquitos are enormous. Badlands, not Black Hills, that's right. It's pretty. And we always saw prairie dogs and fed them Riccola lozenges one time.